Spring weather has returned to Atlanta, and at Masterpiece Lighting, we couldn’t be more excited for the new season. Trees are budding and flowers are blooming, and you’re likely looking forward to spending more time outside. However, if your home’s outdoor lighting isn’t up to par, or you feel that your current lights make your house look too dated, then we’re here to help. Our showrooms have the exterior lighting options you need to update your outdoor space this spring. No matter where your main outdoor sitting space is – the porch, the patio, or a backyard gazebo – it’s important to have the right lighting. You want the area to be well-lit so that people can see as they approach, but you also want it to have the perfect ambiance for those cool Georgia evenings. For the porch, options such as outdoor wall sconces or post lights can create the ideal glow that’s bright enough to be safe, but dim enough to be comfortable. If you spend a lot of your time in the gazebo, then an outdoor chandelier or pendant light can be the perfect choice. While the sitting space is the focal point of your home’s exterior, that doesn’t mean the sidewalk or path to the space should be forgotten about when it comes to lighting. 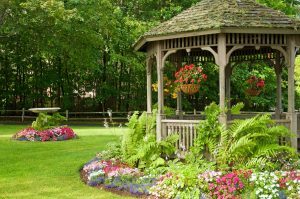 It’s important for people to be able to see as they walk from the front of the house to the back of the house, or from the back door to the gazebo. Landscape and pathway lighting not only provides the illumination you need, but they also highlight and accentuate your yard and the exterior of your home. If you have manicured hedges or shrubbery, then it’s important to have the appropriate ground-level landscape lighting. Now, your sitting area and entertainment area may be the same spot, but if you love having people over for evening cookouts, or you enjoy watching movies on an outdoor screen during the spring and summer, then you’ll need to make sure the space is properly lit. String lights and hanging lanterns can create the cozy environment you want for backyard barbecues and movie showings after sunset. This area is likely larger than your sitting area, and you’ll want every corner and access point to have the appropriate lighting. If there are stairs leading down to the space, then we can help you find the perfect step lights so that no one trips or misses a step when they’re on your property. 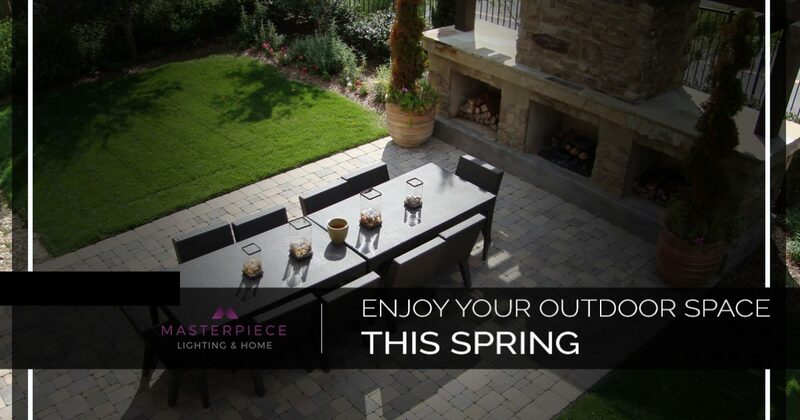 At Masterpiece, we want you to enjoy your outdoor space this spring. If you’re pulling the patio furniture out of storage, or you’re uncovering the pool for the first time this year, make sure you have the right lighting for each space by visiting one of our showrooms today. We have locations in both Midtown and Roswell, and each store has the options you need to upgrade your home’s exterior.